Next I’m going to group them for same month. Now you’ll ask me why grouping is required, we can easily analyse continuous data. The reason is, we are not exactly grouping according to month. Rather we’re grouping them by expiry of derivative series. Most importantly the expiry of Options. Because we will not be trading in spot market. The strategy is executed wholly inside derivative segment of USD-INR. This table demonstrate the reference rate of USD-INR pair for the last 7 months. Here we define another parameter i.e. spread. Spread is the difference of maximum and minimum rate in that month. For the moment do not ask why we need this, just remember we’ll need this later. At this point I’ll talk briefly about some Unicorn called Options. But this will be just an overview. If you want to know more you should read this (I know this is a big read, but that’s how it is. No shortcut). Screw definition, lets understand by an example. Consider USD-INR current spot price (RBI exchange rate) 64.1438 . I go to derivative market and I buy some magical unicorn called USDINR 64 CE. The name itself is complex. So lets simplify this thing. It simply means at the end of current month (Series Expiry) no matter what is the rate of USD-INR, I’ll have an option to buy 1USD at the rate of 64INR. Consider this like as a kind of insurance. Normally you pay a premium. If something happens (rate goes abobe 64) the insurance company pays you back. But the basic funda is, majority of the insurance holder will not claim. That’s how insurance works. In derivative market also, 95% of options expires worthless. Consider the opposite case, at the end of month the rate is 62. So obviously I won’t be willing to buy USD at 64. So the option seller will keep the premium you paid. Now it’s time to understand why you calculated spread. To find the maximum movement in a month. So that we can estimate what is the likelihood, that the strike, at which I sold the option never crosses. You can download the whole spreadsheet from here. But I’ll note down some important observation. Only thrice (3 times) in last 2 years (24 months) the price movement was more than 2. We can make the calculation more lenient, by considering how likely it is for us to take position at worst possible condition. But this will do for us now. 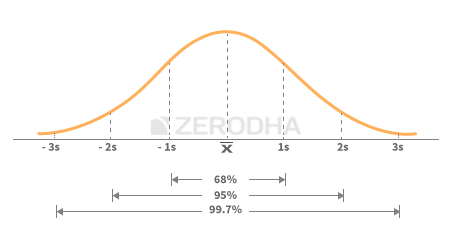 The change in currency price in a day should follow Normal distribution. If you want to check if that’s true, go on plot the changes. But remember if we plot the changes as I provided, it’ll never come in normal distribution, because I’ve ignored sign of the change (took only magnitude for calculation). Now you should ask why I ignored the sign then? Well, the reason is we’ll make the strategy more general than selling just call option. And even if I do so it’ll increase our margin of error, not decrease it. We ignored liquidity factor associated with that strike. In simple words, we ignored the check if someone is really ready to buy at that strike (Because I can sell only when somebody is ready to buy). Volatility in market should give you higher liquidity in high strike prices. The probability of an OTM (Out-OF-The-Money) option, with STRIKE PRICE more or less 2.34, expiring ITM (In-The-Money) is less than 5%. That’t it, we found a statistically probable strategy. It’s simple,has lower cost than spot market and as it’s selling options, the margin required can be given by pledging equity shares in your DEMAT account. Sell OTM options with strikes 2.34 away from current reference rate, you’ll make profit 95% of the time. In reality we need to slightly modify the strategy considering real situation. If the geo-politacal situation is extremely stable we can trade with even lower strike. Even a strike 1SD away is not crossed in 63% cases (we can earn higher premium, by taking a bit more risk).We also need to consider liquidity factor for the strike. Credits: I borrowed a image from Zerodha Versity. Thay have some excellent educational resource for free. You should of course read that if you want to start trading seriously.